A parametric risk transfer is based on an independent parameter or index that correlates with clients’ losses. The parametric solution has a long tradition in the area of weather derivatives and insurance-linked securities – both hedging models work in cooperation with the capital market, which belong to the alternative risk transfer. Especially for products that are currently not possible or difficult to insure, the combination of the blockchain with parametric triggers seems to reveal possibilities which previously could only be dreamed about. In traditional insurance, parametric triggers play a very minor role, as there is an obligation to prove that the damage incurred. This often requires a long review process and, in the case of syndicated contracts in particular, due to different wordings of the insurers involved, legal disputes can also arise and the settlement of major losses can often take months or even years — which is of course not in the interests of the insurer, as they are dependent on a quick payment. However, it seems difficult for existing insurance companies to switch to the parametric model. 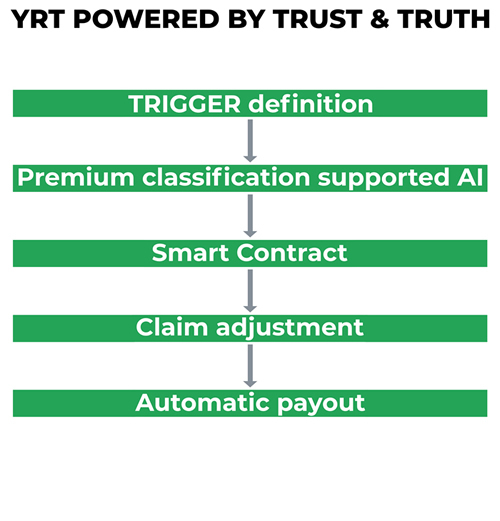 All calculation models of insurers and reinsurers are based on traditional wording, and are suitable for conversion to parametric triggers in combination with the blockchain technology. Although the graphic quite impressively proves that such a solution is clearly more efficient and therefore more cost-effective in claims processing. A qualitative research of the BlockART Institute with representatives of the risk and captive management industry showed which “pain” risk and captive managers are currently experiencing. RYSKEX thought about this and designed the so-called PRICE (Political Sanctions, Reputation Damage, Innovation Failure, Cyber Attacks and Equity) model. In the context of research and war gaming, various real use cases were developed and parametric triggers were developed with customers and pilot partners. To round off the concept, the BlockART Institute has developed the Trust & Truth Model. The RYSKEX ecosystem forms the heart of the system. Basically, it is a marketplace where policy holders and risk takers (investors) meet to arrange a transfer of risk. As described in the previous article, the ecosystem is based on the blockchain solution to ensure transparency for all involved and to ensure that policy holder claims are paid in the event of a loss. Another emerging technology is the use of artificial intelligence in pricing. Traditional actuarial approaches cannot be used to calculate these risks because there is too little historical data available. Accordingly, a questionnaire is used to calculate the premium, which will vary depending on the risk being hedged. The client must complete it truthfully. However, it is easy to understand and contains a maximum of twenty questions. On the basis of this questionnaire and data from external service providers, the risk is classified with the help of artificial intelligence, using the green-yellow-red system familiar from traffic lights. Displaying the exact matrix would be too complex; accordingly, the traffic light represents the rating derived from the data. The better the company’s rating, the lower the recommended premium for the risk to be hedged. The Ynnovative Risk Transfer model thus comprises five steps (see below). 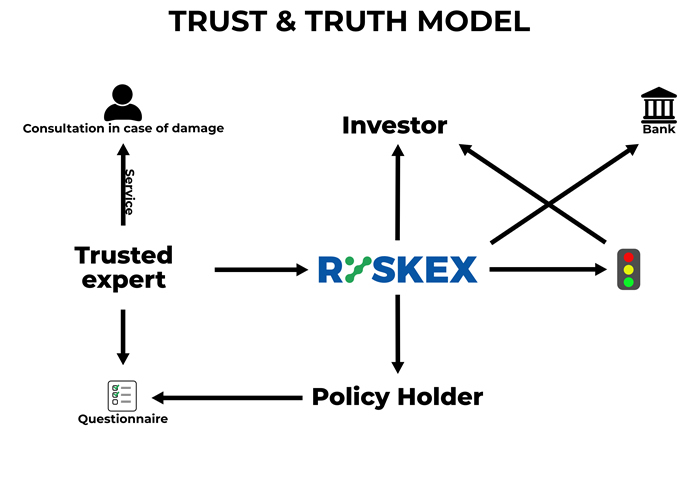 The investor does not handle the claims adjustment; this is instead carried out by RYSKEX as an independent third party. Due to the parametrics, this is only a check to see whether the data relating to the claim corresponds to the facts and is not “fake news”. 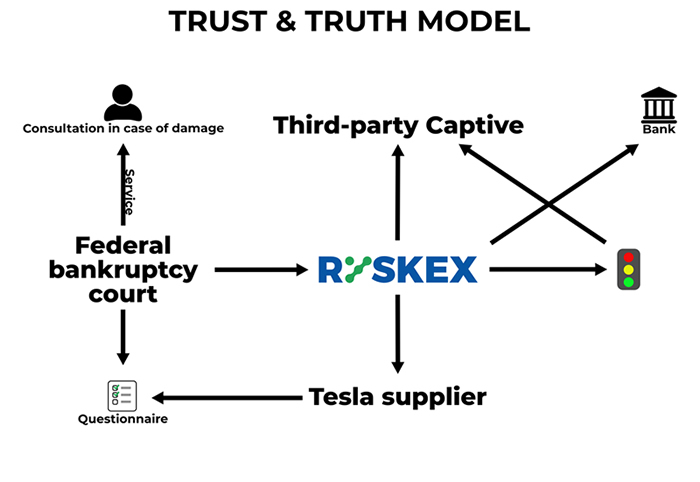 Tesla: the first real case that was secured via the RYSKEX platform is the so-called TESLA case. The policy holder was a German automotive supplier that could not have its accounts receivable covered by the traditional credit insurance market due to capacity problems. An alternative would have been the financial market or a CDS, which is relatively very expensive and did not correspond to the customer’s idea. Accordingly, a questionnaire was developed for the client and the exact data collected along with data from various external sources were used to calculate the probability of Tesla’s filing for Chapter 11 bankruptcy protection and to recommend an appropriate premium. Chapter 11 was defined as the trigger and the data came from the federal bankruptcy courts. The risk taker was an Asian hedge fund that underwrote the risk for 12 months and received the premium accordingly. The contract was signed via the RYSKEX ecosystem. This was a true pilot project that can serve as a blueprint for other market participants. Currently, work is underway on a concept to help corporations hedge against cyber risks. There are also already well-known partner companies from the German-and French-speaking countries. Companies’ risks are changing and expectations of market participants’ willingness to find solutions are also changing. It has become clear, however, that many captive owners have a long-standing and good relationship with their insurers and reinsurers, and are therefore reluctant to build up pressure in response to requests for innovative concepts such as parametric solutions or the use of blockchain technology. 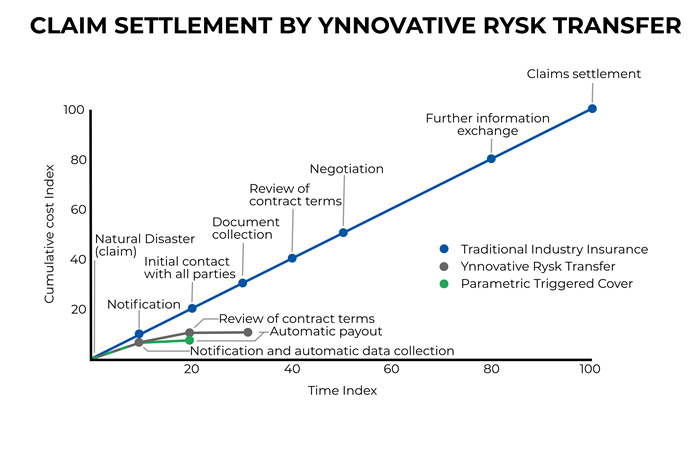 RYSKEX was inspired by all the new technological opportunities to devise the Ynnovative Risk Transfer approach. To what extent this will be revolutionary for the risk and captive market will depend on the acceptance of the blockchain and the level of trust in artificial intelligence. However, it is clear that new risks require new solutions and new approaches.